'Isabelle' ( Bee Warburton, R. 1988). Seedling Bs/B-1. SIB, 27" (69 cm), Late bloom. Standards cream; cream and yellow styles with curled crests and green heart; Falls open bright yellow, then fade to pale yellow with dark yellow veining with green influence; heavily ruffled. 'Butter And Sugar' X 'Bellissima'. Joe Pye Weed's Garden 1989. 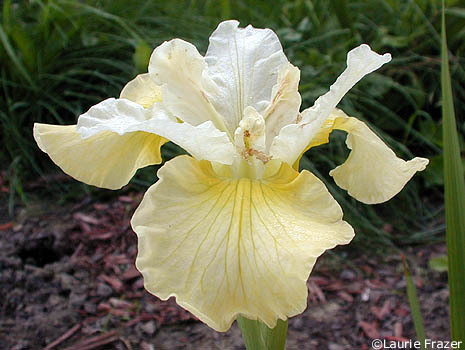 From AIS Bulletin #273 April 1989 Introducing ISABELLE-Warburton SIBERIAN, 27", L. A graceful flower dressed in large and small ruffles of yellow, cream and green, Isabelle carries the best qualities of its parents to a pinnacle of fashion. A yellow amoena of spectacular form, it has a green heart, dark yellow and green veins and a vigorous and sturdy plant habit. Butter and Sugar X Bellissima. $30.00. Joe Pye Weed's Garden.